USFSP students advocate for the university in Tallahassee. 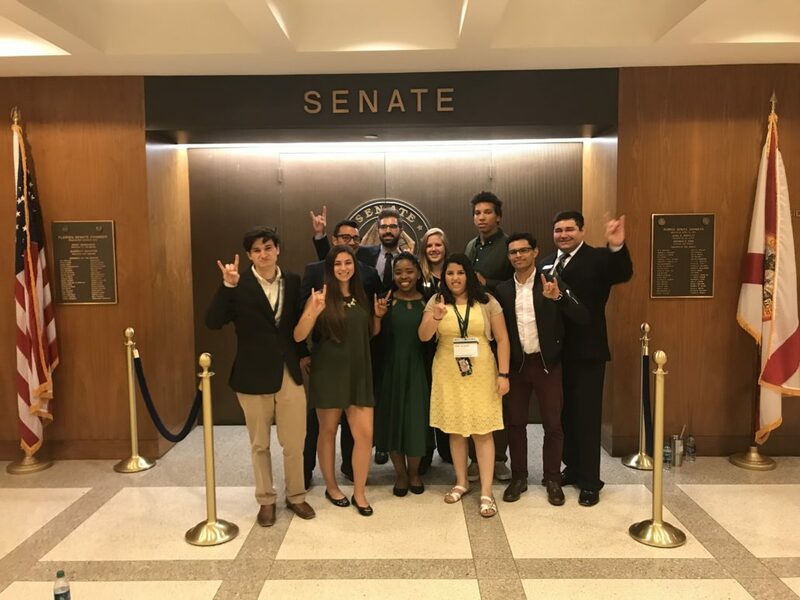 (Feb. 11, 2019) – On February 13, hundreds of USF students will board buses bound for Tallahassee, where they’ll meet state legislators and advocate for the university at the annual Day at the Capitol. Throughout their trip, students will discuss USF System’s legislative priorities with dozens of elected officials while witnessing firsthand how state government works and policy is made. This year, around 50 USFSP students will be traveling to Tallahassee. For Ysati Jordan, a third-year senior majoring in health science, an opportunity to attend another Day at the Capitol is one she wouldn’t pass up. For the past three years, Jordan, who serves as Student Body Vice President for USF St. Petersburg, has woken up before dawn to board a bus with dozens of other USFSP students before dozing back to sleep during the five-hour ride to Florida’s capital. About a half-hour out from Tallahassee, the bus caravan pulls over at a rest stop, where students change into green and gold outfits to represent the university. At the capitol building, green and gold banners welcome students, who are separated into groups, independent of their campus, allowing them to network with their peers from Tampa and Sarasota-Manatee. Student groups are assigned a set of USF System legislative priorities to advocate for. Among Jordan’s topics in previous trips have been funding for science, technology, engineering, and math (STEM) programs, and money for the USF Health Morsani College of Medicine and Heart Institute to be moved to downtown Tampa. Thanks in part to her efforts, both programs have since been approved. This year, students will advocate for USF’s path to preeminence, continued support for the College of Medicine, and ways to maximize the impact of the USF System consolidation. This will be the first Day at the Capitol for Gregory Cote, a second-year junior majoring in biology and Chair of Appropriations for USFSP Student Government. Cote looks forward to representing USFSP and advocating for issues that can have a positive impact for his peers. “I want to advocate for students here and be able to get more support for the causes that are near and dear to our campus,” he says. Dwayne Isaacs, Director of Student Life and Engagement, encourages all students to consider attending Day at the Capitol during their time at USFSP. “Our participation in Day at the Capitol helps our students have a unique experience that allows them to connect and dialogue with elected representatives at our state capital,” says Isaacs, “Its an annual opportunity for students to have their voices heard, but also provides them a hands on experience with our state government and its operations.